One of the major stories this weekend was out of the golf world. Tiger Woods has been absolutely dominating the pro golfing circuit, but yesterday, someone slew the giant. Tiger Woods was 14-0 when sitting atop the leader board heading into the final round of a major tournament. So, history suggests, he should have taken the PGA Championship. But Korean-born Y.E. Yang put on a marvelous performance to take out Tiger. It was simply a magical day for Yang, and a gigantic upset, considering that Tiger almost always trounces the underdog in the end. He even said (via translator), “This may be my last win as a golfer, but it sure is a great one”. Congrats to Yang for a tremdous achievement. In the NFL, some good news for Jets fans. 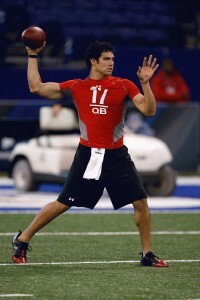 They took the highly-touted Mark Sanchez out of USC with the 5th pick, hoping that he would become their savior. Well, according to the organization, Sanchez has been playing well in practice and is respected by the first string. They even said, ‘he had to earn his spot, and he has thus far’. So, with a nice showing in his first pre-season game, he will be starting at QB in the Jets next pre-season game. And it’s against none other than the league’s best defense: The Baltimore Ravens. Sanchez said this would be a real test for him, but he’s excited about it. Elsewhere in the NFL, the Eagles recent acquisition, Michael Vick, admitted on 60 minutes that he cried in prison. Vick said he used to weep over how regretful he felt about his dogfighting days. He said he initially lied about the dogfighting because he realized it would put his career in jeopardy. So he acted as if he had nothing to do with it, but he knew he was guilty, and his lying attempt backfired on him 10-fold. In retrospect, he said, he should have just told the truth from the outset. In the end, Vick admitted that he has only himself to blame. 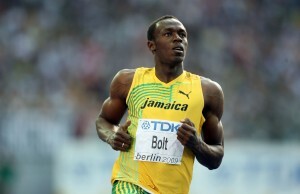 Finally, Olympic Gold Medalist, Usain Bolt, the world’s fastest man, set another amazing record yesterday. At the Olympics, he set the record for the 100m sprint (the event that determines the fastest man alive), but even then, it looked like he was celebrating in the last second, thus slowing his time a bit. Well, yesterday, he went absolutely full force against American runner Tyson Gay. No celebrating this time, and Bolt shattered his own mark finishing with a 9.58 time. That’s 0.11 faster than his previous record. This guy is truly something special. He’s essentially not even racing anymore, he’s just trying to beat his records. There’s simply nobody who can keep up with him.